I am so excited about this event. 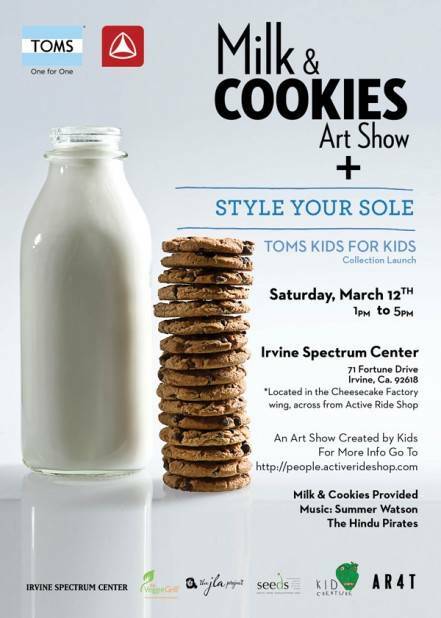 My boys and I have been invited to preview the Milk and Cookies Art Show presented by Toms Shoes and Active Ride Shop. What’s special about the show is that it features creative work from kids — the artists of the future! The show unfolds on Saturday, March 12th, 1-5pm at the Irvine Spectrum Center. Pieces will be available for purchase – proceeds will be donated to Seeds Art and Education, Inc. and the JLA Project. You can check out the Milk and Cookies event page on Facebook as well.